The Carter's bring their son into the business making it a 3rd generation business. Carter's My Plumber prepares the next generation to protect the health of the nation. A snapshot of their history in the plumbing industry begins with Jamie growing up in the plumbing trade with his father’s small plumbing business in Greenwood, Indiana. Jamie graduated from Mechanical Skills Plumbing Trade School and became a licensed Master Plumber and Contractor after high school. 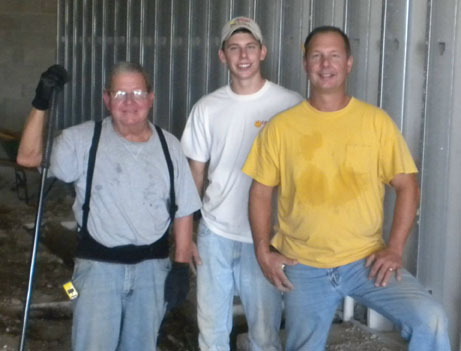 In 1985, Jamie and his father incorporated Carter Plumbing Inc. In 1987, Lisa joined the team to assist in the small plumbing business as it started to grow. After a tremendous amount of growth in the commercial and residential sector, the company’s cash flow continued to lag. Through job costing and analysis, Jamie and Lisa determined new construction was a difficult avenue with slow pay and minimal margins to obtain the projects. Therefore, they looked at other areas of opportunity and discovered the service side of plumbing to be more turn-key. In 1999, they joined another national organization called Plumber’s Success International. They followed the model of this organization, and began growing the service side of the company. They branded the “Smell Good Plumber” in Indianapolis. They also joined the national organization called Airtime 500 for Heating and Cooling Business, and formed a new company called Carteraire Heating and Cooling. Throughout the course of business, they purchased seven small plumbing and heating businesses in the Indianapolis Metropolitan area. They operated 35 trucks and 3 service centers in the Indianapolis Metropolitan area. In 2003, Jamie and Lisa took on the conversion process to become a franchise with Ben Franklin Plumbing and One Hour Heating & Air Conditioning. They maintained the delicate balance of transitioning their company from one identity with strong market share to an unknown identity. Through their own creative marketing efforts and abilities, they put Ben Franklin and One Hour on the map in Indianapolis. The headquarters and call center were located in Greenwood, with a service center and branch managers at a Plainfield location and a Fisher’s location. In 2007, the opportunity came to sell their business. The purchasing company was the mother-ship company of the franchise, who came into the Indianapolis market and purchased Dial One. It made logical sense to sell because of the necessary transitions, and the vast opportunity it created for their management team and technicians. Today, many of their managers have risen through the ranks and taken on more responsibility. Many of their plumbers are continuing the success they had with the company. They both missed working together and the synergy they capture in operating a Plumbing Service Business. Their son, Kelson, is now pursuing the plumbing trade and it is his desire to follow his father and grandfather's legacy in the plumbing industry. Kelson makes the business a 3rd generation company, which is a rarity. Only 12% of businesses ever make it to the 3rd generation. They have made a “Remake” and created Carter's My Plumber to service the Indianapolis Metropolitan area, knowing their past experience has prepared them to design a company to take care of their customer's plumbing needs for another generation!